The Black Circle by Patrick Carman, a Mysterious Review. Review: Amy and Dan are back for the fifth installment in the 39 Clues series, The Black Circle, written by Patrick Carman. This time they are off to Russia, home of the notorious Irina Spasky, who follows them at every turn. What will happen now as they are in the territory of their worst nightmare? Or is she really the threat they must fear? The book starts off with the yelling of, "Telegram for Mr. Cahill!" Amy, who is rudely awakened from an excellent dream, answers the door and receives the telegram from the child and then attempts to wake up Dan. Dan slowly wakes up but once he reads what is on the telegram, he becomes very wide eyed. The telegram spoke of a bottle cap collection that Dan had owned about a year ago. Along with it were numbers for a locker at the airport that contained items that would help them in their search. So Amy and Dan immediately left their hotel in Cairo, sadly leaving their au pair and cat behind, so they could pursue the hunt quicker. After a fast and scary cab ride to the airport, they realized to their dismay that the Kabras, another pair in the hunt, had followed them to the airport. There was a confrontation curbside, then Amy and Dan fled to the crowds of the airport, and lost the Kabras by putting their tracking device onto a baby stroller. The kids then fled to the locker room. There they found a clue to their next destination, Russia. The kids will have to stay focused on the hunt to succeed in Russia. Nothing is what it seems, and they may have to team up with another team to solve the clues. First and foremost I thought the book was very well put together. Carman was able to put action and adventure into a story, while still adding in the rich history of Russia itself. 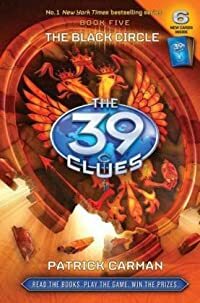 Many books that are like The 39 Clues series forget the cultural aspect of the places they go and only rely on the action and adventure to pull the reader through the book. But when you add the history it makes the book seem to flow with a more mysterious aura. This book would be good for anyone in middle school down to late elementary school and would be excellent for both boys and girls. The only problem I had with the book was the title. I feel that the title of The Black Circle gives away a concept that happens at the very end of the book, and will probably be in books to come. Other than that, it was a very good book. In the end I would probably give the book four of five stars. It was a very good book, nearly every part of it was grabbing the reader for attention but some points were awkward or didn't go together quite right. Like I said it was very good it just wasn't excellent. Still I can't wait for the next book to come out, the series itself is awesome! Special thanks to guest reviewer Margo Nauert for contributing her review of The Black Circle. Acknowledgment: Scholastic provided a copy of The Black Circle for this review.